What is Your Favorite Taste of Summer? You are here: Home » What is Your Favorite Taste of Summer? If you’re tasting the first crunchy snap peas or juicy sweet strawberries of the season, or finishing off the last of the blueberries in your freezer from the past year, you know what summertime tastes like. Summer tastes sweet and satisfying, fresh and fulfilling and it’s all available right here in Whatcom County. 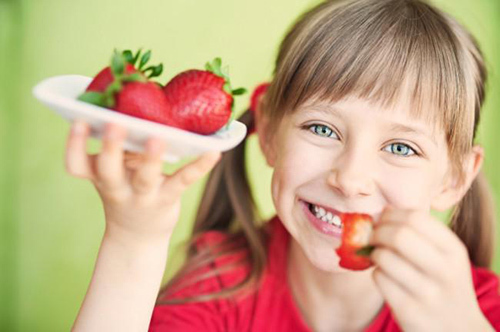 Summertime is a perfect season to introduce new fresh foods for your child to try. We know freshly harvested, local foods taste way better than foods grown hundreds of miles away, and we also know that kids are more likely to try foods that they plant, harvest and/or prepare themselves. Try letting your child choose a new item at the farmer’s market and find a recipe for your family to prepare together. Or have some family fun picking out seeds to plant in your garden and let the children care for and harvest the veggies that they grow. They will likely get curious and try a bite or two. Remember that children may need to try a new item 10-12 times before they grow to like it. You can give your family the gift of tasting a bit of summer by heading to a local U-pick farm, your local farmer’s market or even your own backyard garden. If you are looking for U-pick farms or a list of farmer’s markets, Sustainable Connections’ Food & Farming Program has got you covered with the Whatcom Food & Farm Finder. Just keep presenting the opportunities and before you know it, your kids will fall in love with a new taste of the summer!